The mountainous western part of North America is called a "cordillera". The North American Cordillera is the North American portion of the American Cordillera which is a mountain chain (cordillera) along the western side of the Americas. The North American Cordillera covers an extensive area of mountain ranges, intermontane basins, and plateaus in western North America, including much of the territory west of the Great Plains. It is also sometimes called the Western Cordillera, the Western Cordillera of North America, or the Pacific Cordillera. The precise boundaries of this cordillera and its subregions, as well as the names of its various features, may differ depending on the definitions in each country or jurisdiction, and also depending on the scientific field; this cordillera is a particularly prominent subject in the scientific field of physical geography. 2.3 Pacific Border Province in contiguous U.S.
3.2 Cascade–Sierra Mountains in contiguous U.S.
4.2 Rocky Mountain System in contiguous U.S.
5.2 Portion in contiguous U.S.
6.2 Portion in contiguous U.S.
Physiographic divisions of the western United States include three mountain systems: the Rocky Mountain System (areas 16–19), the Cascade–Sierra Mountains (23), and the Pacific Border Province (24). 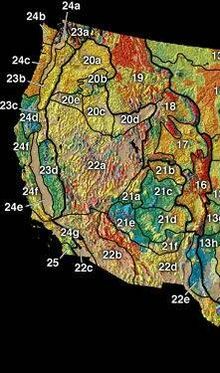 Physiographic divisions of Mexico include three mountain systems: the Sierra Madre Oriental, the Sierra Madre Occidental, and the Sierra Madre del Sur (which is an extension of the Peninsular Ranges). This cordillera extends from the U.S. state of Alaska to the southern border of Mexico. The North American Cordillera includes some of the highest peaks on the continent. Its mountain ranges generally run north to south along three main belts: the Pacific Coast Ranges in the west, the Nevadan belt in the middle (including the Sierra Nevada), and the Laramide belt in the east (including the Rocky Mountains). These three orogenic belts (also called "orogens") arose due to the engagement of tectonic plates which deformed the Earth's lithosphere (crust and uppermost mantle). For example, the Laramide orogeny changed the topography of the central Rocky Mountains and adjoining Laramide regions (from central Montana to central New Mexico) during the Late Cretaceous 80 million years ago. Prior to this time the Rocky Mountain region was occupied by a broad basin. Further topographical evolution occurred during the Eocene (55–50 million years ago) and Oligocene (34–23 million years ago), but since that time the region has been relatively stable. Generally speaking, it will be convenient here to consider these three belts going west to east, and north to south. In Alaska, south of the Interior Plains area, is the Rocky Mountain System, then the Intermontane Basins and Ranges, and in the southern part of the state are the Pacific Mountains and Valleys. In the Alaska panhandle, the mainland mountain ranges and offshore islands (the Alexander Archipelago) are extensions of respective ranges further south. In Canada, the North American Cordillera is usually divided into three physiographic regions: the western system, the interior system, and the eastern system. The western system includes the Coast Mountains, the interior system includes the Columbia Mountains, and the eastern system includes the Canadian Rockies. At its midsection between San Francisco, California and Denver, Colorado, the North American Cordillera is about 1,000 miles (1,600 km) wide, and its physiographic provinces at this midpoint are as follows, going from west to east: the Pacific Coast Ranges, the Central Valley, the Sierra Nevada, the Basin and Range Province (forming many narrow ranges and valleys), the Colorado Plateau, and the Rocky Mountains. In the United States, another major feature of the Cordillera is the Columbia Plateau, located north of California between the Cascade Range — which is a northern extension of the Sierra Nevada — and the Rocky Mountains. In Mexico, the Sierra Madre Occidental, and the Sierra Madre Oriental further east, surround the Mexican Plateau. To the west of the Sierra Madre Occidental, the Peninsular Ranges border the Pacific Ocean, and the Sierra Madre del Sur is the southern extension of the Peninsular Ranges. Sierra Madre means "Mother Range" in Spanish. The Nevadan belt runs up and down the middle of the North American Cordillera. Therefore, the intermontane areas of the cordillera can be divided up into the areas east of the Nevadan belt, and those west of the Nevadan belt. The Pacific Coast Ranges, comprising the Pacific Coast Belt, parallel the North American Pacific Coast, and comprise several mountain systems. Along the British Columbia and Alaska coast, the mountains intermix with the sea in a complex maze of fjords, with thousands of islands. Off the Southern California coast the Channel Islands archipelago of the Santa Monica Mountains extends for 160 miles (260 km). In southern Alaska, the primary mountain ranges are the Alaska Range, Wrangell Mountains, Saint Elias Mountains, Kenai Mountains, Chugach Mountains, and Talkeetna Mountains. The Yukon Ranges comprise the mountains in the southeastern part of the U.S. state of Alaska and most of the Yukon, Canada. This range has an area of 364,710 km2 (140,820 sq mi). The Coast Mountains run from the lower Fraser River and the Fraser Canyon northwestward, separating the Interior Plateau from the Pacific Ocean. Their coastal flank is characterized by an intense network of fjords and associated islands, very similar to the Norwegian coastline, while their inland side against the plateau they transition to the high plateau in dryland valleys notable for a series of large lakes similar to the alpine lakes of southern Switzerland, beginning in deep mountains and ending in flatland. They are subdivided in three main groupings, the Pacific Ranges between the Fraser and Bella Coola, the Kitimat Ranges from there northwards to the Nass River and the Boundary Ranges from there to their terminus in the Yukon Territory at Champagne Pass and Chilkat Pass northwest of Haines, Alaska. The Saint Elias Mountains lie to their west and northwest, while the Yukon Ranges and Yukon Basin lie to their north. On the inland side of the Boundary Ranges are the Tahltan and Tagish Highlands and also the Skeena Mountains, part of the Interior Mountains system, which also extend southwards on the inland side of the Kitimat Ranges. The terrain of the main spine of the Coast Mountains is typified by heavy glaciation, including several very large icefields of varying elevation. Of the three subdivisions, the Pacific Ranges are the highest and are crowned by Mount Waddington, while the Boundary Ranges contain the largest icefields, the Juneau Icefield being the largest. The Kitimat Ranges are lower and less glacier-covered than either of the other two groupings, but are extremely rugged and dense. The Coast Mountains are made of igneous and metamorphic rock from an episode of arc volcanism related to subduction of the Kula and Farallon Plates during the Laramide orogeny about 100 million years ago. The widespread granite forming the Coast Mountains formed when magma intruded and cooled at depth beneath volcanoes of the Coast Range Arc whereas the metamorphic formed when intruding magma heated the surrounding rock to produce schist. The Insular Mountains extend from Vancouver Island in the south to the Queen Charlotte Islands in the north on the British Columbia Coast. It contains two main mountain ranges, the Vancouver Island Ranges on Vancouver Island and the Queen Charlotte Mountains on the Queen Charlotte Islands. Pacific Border Province in contiguous U.S. The Olympic Mountains is a mountain range on the Olympic Peninsula of western Washington in the United States. The mountains, part of the Pacific Coast Ranges, are not especially high – Mount Olympus is the highest at 7,962 ft (2,427 m) – but the western slopes of the Olympics rise directly out of the Pacific Ocean and are the wettest place in the 48 contiguous states. Most of the mountains are protected within the bounds of the Olympic National Park. The Oregon Coast Range is the part of the Coast Range system that is denoted as between the mouth of the Columbia River and the Middle Fork Coquille River. It is about 200 miles (320 km) long. The highest peak is Marys Peak, at 4,101 ft (1,250 m). The California Coast Ranges are one of the eleven traditional geomorphic provinces of California. This province includes several – but not all – mountain ranges along the California coast (the Transverse Ranges, Peninsular Ranges and the Klamath Mountains are not included). The Sierra Madre del Sur mountains in southwestern Mexico form a southern extension of the Peninsular Ranges of Baja, California. The Peninsular Ranges are separated from the Sierra Madre del Sur by an expanse of ocean. The Nevadan belt is located between the Pacific coast belt and the Laramide belt. Nevada means "snow-covered" in Spanish. In Canada, the Northern Interior Mountains are a northern extension of the Columbia Mountains. They include the Hazelton Mountains, Cassiar Mountains, Omineca Mountains, and Skeena Mountains. The Columbia Mountains are a designation in British Columbia for a group of four ranges lying between the Rocky Mountain Trench (to the east) and the Interior Plateau (to the west). These ranges are the Cariboo Mountains, which are the northernmost and sometimes considered to be part of the Interior Plateau, the Selkirk Mountains, the Purcell Mountains, and the Monashee Mountains. The Columbia Mountains are classified as being in Canada's interior system, rather than its eastern system. However, the Columbia Mountains are an extension of mountains in the United States that are considered part of the Rocky Mountains, and therefore the Columbia Mountains are often treated as being part of the Rockies. The Selkirks and Purcells lie entirely within the basin of the Columbia River, while the Monashees lie to the river's west on its southward course from its Big Bend and are flanked on the west by the basin of the Thompson and Okanagan Rivers. There are many named subranges of all four subgroupings, particularly in the Selkirks and Monashees. The southward extension of the Selkirks, Purcells and Monashees into the United States are reckoned to be part of the Rocky Mountains and the designation Columbia Mountains is not used there (the Purcells, also, go by the name "Percell Mountains" in the United States). The Salish and Cabinet Mountains south of the Kootenai River are essentially part of the same landform, but are officially designated part of the Rocky Mountains in the United States. To the west of the Monashees and Cariboos, there are three intermediary upland areas which are transitional between the mountain ranges and the plateaus flanking the Fraser and Thompson Rivers. These – the Quesnel, Shuswap and Okanagan Highlands, are sometimes considered as being part of the neighbouring ranges rather than the plateaus and are often spoken of that way locally but are formally designated as being part of the Interior Plateau. The southernmost extends into the Washington, where it is named by the American spelling Okanogan Highland (and was the first-named of these groupings). Cascade–Sierra Mountains in contiguous U.S. The Cascade Range (called the Cascade Mountains in Canada) extends from northern California in the United States to British Columbia, Canada. It consists of non-volcanic and volcanic mountains: all of the known historic eruptions in the contiguous United States have been from the volcanoes of the Cascade Volcanic Arc. The highest peak in the Cascade Range is Mount Rainier (14,409 feet (4,392 m)), a stratovolcano. The small portion of the Cascade Range in Canada is called the Cascade Mountains or Canadian Cascades, and in its southwestern area is similar in terrain to the area north of Glacier Peak, known as the North Cascades, and its northern and eastern extremities verge on the Thompson Plateau in a less rugged fashion than in most other parts of the range. The North Cascades are very different in character from the series of high volcanic stratovolcanoes from Rainier southwards to Mount Shasta and Lassen Peak, and is more severely alpine and steeply rugged, particularly the Skagit Range. Inland portions of the range are dryland and plateau-like in character, e.g. the Okanagan Range, which lies along the Cascades' northeastern margin, separated by the Similkameen River. The Sierra Nevada forms an inland mountain spine of northern California, extending from the terminus of the Cascade Range south of Lassen Peak southwards along the east flank of the Central Valley of California to the Transverse Ranges, forming a mountain region of complex terrain and varied geology which separates the Central Valley from the Great Basin to the east. The mean height of the mountain summits in the Sierra Nevada gradually increases from north to south, culminating at Mount Whitney (14,505 feet (4,421 m)), the highest point in the contiguous United States. From east to west, the Sierra is wedge-shaped: the west slope gradually rises and the east slope forms a steep escarpment, particularly so in the southern portion. The northern Sierra surface rocks are predominantly volcanic, while the southern Sierra granitic batholith has been sculpted by glaciers into dramatic U-shaped valleys and thin ridges called Arêtes. The Sierra Madre Occidental mountain range is a southern extension of the Sierra Nevada. The range extends from near the Arizona border down to the Sierra Madre del Sur, along the western mainland of Mexico. The high plateau that is formed by the range is cut by deep river valleys. The Laramide belt is on the side of the North American Cordillera most distant from the Pacific Coast Ranges. It is named for the Laramie Mountains of eastern Wyoming (in turn named for Jacques La Ramee, a trapper who disappeared in the Laramie Mountains in 1820 and was never heard from again). The Brooks Range includes the northernmost of the major mountain systems of the North American Cordillera, and extend along an east–west axis across northern Alaska from near the northern opening of the Bering Strait to the northern Yukon Territory. Major subranges include the British Mountains and Richardson Mountains, towards their eastern end, and at their farthest west is the small subrange that De Long Mountains. The Brooks Range forms the northern flank of the lower Yukon River basin, separating it from Alaska's North Slope region, facing the beaufort Sea. The Brooks Range is considered part of (or an extension of) the Rockies. South of the Brooks Range are the Mackenzie Mountains, and the Canadian Rockies. Rocky Mountain System in contiguous U.S. In the Rocky Mountains, the highest peak is Mount Elbert in Colorado at 14,439 feet (4,401 m) above sea level. The American Rockies rise steeply over the Interior Plains to the east, and over the Great Basin to the west, and extend south to the Rio Grande in New Mexico. The United States definition of the Rockies includes the Cabinet and Salish Mountains of Idaho and Montana, whereas their counterparts north of the Kootenai River, the Columbia Mountains, are sometimes considered a separate system lying to the west of the huge Rocky Mountain Trench which runs the length of British Columbia. The Sierra Madre Oriental mountains in eastern Mexico are a southern extension of the Rocky Mountains. The Sierra Madre Oriental spans about 1,000 km (600 miles). 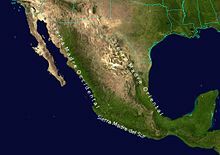 Mexico's Gulf Coastal Plain lies to the east of the range, between the mountains and the Gulf of Mexico coast. The Mexican Plateau lies to the west of the range. The Nevadan belt runs down the middle of the North American Cordillera. Therefore, the intermontane areas can be divided up into the areas east of the Nevadan belt, and those west of the Nevadan belt. The Interior Plateau is the northern continuation of the Columbia Plateau, and covers much of inland British Columbia. The Cariboo Mountains and Monashee Mountains lie to the east, the Canadian Cascades are to the southwest, and the Hazelton Mountains and Coast Range to the west and northwest. 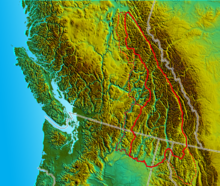 Within the Interior plateau, the Shuswap Highland consists of a portion of the foothills between the Thompson Plateau and Bonaparte Plateau on the west, and the Monashee Mountains and Cariboo Mountains on the east and northeast. Also within the Interior plateau, the Thompson Plateau forms the southern portion of the Interior Plateau. It is bordered on the south by the Canadian Cascades and on the north by the Thompson River. The Okanagan Highland is the part of the Interior Plateau to the east of the Thompson Plateau, and is bounded by the Okanagan River on the west, the Shuswap River on the north, and the Kettle River on the east side. The Okanagan Highland is described as being a hilly plateau, and is located in southern British Columbia and northern Washington. The Interior Plateau also includes the Quesnel Highland, Fraser Plateau, Nechako Plateau, and McGregor Plateau. California's Central Valley is a large, flat valley that dominates the central portion of California, stretching inland and parallel to the Pacific Ocean coast. Its northern half is referred to as the Sacramento Valley, and its southern half as the San Joaquin Valley. The two halves meet at the huge Sacramento-San Joaquin River Delta of the Sacramento and San Joaquin Rivers, which along with their tributaries drain the majority of the valley. The Central Valley covers an area of approximately 22,500 square miles (58,000 km2), making it slightly smaller than the state of West Virginia and about 13.7% of California's total area. The Central Valley is 40 to 60 miles (60 to 100 km) wide, with the Sierra Nevada to the east and the Coast Ranges to the west. The Gulf of California is a body of water that separates the Peninsular Ranges from the Sierra Madre Occidental on the Mexican mainland. The Gulf of California is 1,126 km (700 miles) long and 48 to 241 km (30 to 150 miles) wide, with an area of 177,000 km2 (68,000 sq mi), a mean depth of 818.08 m (2,684.0 ft), and a volume of 145,000 km3 (35,000 cu mi). The Rocky Mountain Trench is a large valley that extends approximately 1,600 km (990 mi) from Flathead Lake, Montana, to the Liard River, just south of the British Columbia–Yukon border near Watson Lake, Yukon. The trench bottom is 3 to 16 km (2 to 10 miles) wide and ranges from 600 to 900 m (2,000 to 3,000 ft) above sea level. The general orientation of the Trench is almost uniformly pointing north. Some of its topography has been carved into glacial valleys, but it is primarily a byproduct of faulting. The Trench separates the Rocky Mountains on its east from the Columbia Mountains and the Cassiar Mountains on its west. It is up to 25 km (16 miles) wide, if measured peak-to-peak. For convenience the Rocky Mountain Trench may be divided into northern and southern sections. The dividing point reflects the separation of north and easterly flows to the Arctic Ocean versus south and westerly flows to the Pacific Ocean. A break in the valley system at around 54°N near Prince George, British Columbia may be used for this purpose. There are three main mountain ranges in the Canadian area named the Rocky Mountains, the Columbia Mountains, and the Coast Mountains. The Basin and Range province covers most of the state of Nevada and parts of the states of Arizona, California, Idaho, New Mexico, Oregon, Texas, Utah, and Wyoming, as well as much of northern Mexico. It is an extremely arid region characterized by basin and range topography. The Colorado Plateau is an area of high desert located in Arizona, New Mexico, Colorado, and Utah, bisected by the Colorado River which flows westward through the southern part, and the Green River which flows south from the northernmost part of the plateau. The Green is a tributary of the Colorado, the confluence being west of Moab, Utah in Canyonlands National Park. The Mexican Plateau is one of six distinct physiographic sections of the Basin and Range Province, which in turn is part of the Intermontane Plateaus physiographic division. It is a large arid-to-semiarid plateau that occupies much of northern and central Mexico. Averaging 1,825 m (5,988 ft) above sea level, it extends from the United States border in the north to the Trans-Mexican Volcanic Belt in the south, and is bounded by the Sierra Madre Occidental and Sierra Madre Oriental to the west and east, respectively. A low east–west mountain range in the state of Zacatecas divides the plateau into northern and southern sections. These two sections, called the Northern Plateau (Spanish: Mesa del Norte) and Central Plateau (Spanish: Mesa Central), are now generally regarded by geographers as sections of one plateau. ^ R. Saager & F. Bianconi (1971). "The Mount Nansen gold–silver deposit, Yukon territory, Canada". Mineralium Deposita. 6 (3). doi:10.1007/BF00208030. ^ D. S. Cowan (1985). "Structural styles in Mesozoic and Cenozoic melanges in the Western Cordillera of North America". Geological Society of America Bulletin. 96 (4): 451. doi:10.1130/0016-7606(1985)96<451:SSIMAC>2.0.CO;2. ^ a b Melanie Ostopowich (2005) The Cordillera, Weigl Educational Publishers Limited, ISBN 1553881494, pp. 6, 12, and 20: "The Cordillera is one of the seven geographic regions in Canada". ^ The Encyclopedia Americana: a library of universal knowledge, Encyclopedia Americana Corp., 1918, ISBN 0717201333, p. 687: "[N]ame from the Spanish....It is used particularly in physical geography, although in geology also it is sometimes applied...."
^ a b Frank Press and Raymond Siever Earth, pp. 534–535, Macmillan, 1986. ^ A. J. Eardley (1967). "Western Cordillera—Alaska to Mexico: ABSTRACT". AAPG Bulletin. 51 (9): 1900–1901. doi:10.1306/5d25c1b1-16c1-11d7-8645000102c1865d. ^ T. O. Tobisch; S. R. Paterson; S. Longiaru; T. Bhattacharyya (1987). "Extent of the Nevadan orogeny, central Sierra Nevada, California". Geology. 15 (2): 132. doi:10.1130/0091-7613(1987)15<132:EOTNOC>2.0.CO;2. ^ P. J. Coney & T. A. Harms (1984). "Cordilleran metamorphic core complexes: Cenozoic extensional relics of Mesozoic compression" (PDF). Geology. 12 (9): 550. doi:10.1130/0091-7613(1984)12<550:CMCCCE>2.0.CO;2. ^ M. E. McMillan; P. L. Heller & S. L. Wing (2006). "History and causes of post-Laramide relief in the Rocky Mountain orogenic plateau" (PDF). Geological Society of America Bulletin. 118 (3–4): 393. doi:10.1130/B25712.1. ^ W. R. Dickinson; M. A. Klute; M. J. Hayes; S. U. Janecke; E. R. Lundin; M. A. McKittrick & M. D. Olivares (1988). "Paleogeographic and paleotectonic setting of Laramide sedimentary basins in the central Rocky Mountain region". Geological Society of America Bulletin. 100 (7): 1023. doi:10.1130/0016-7606(1988)100<1023:PAPSOL>2.3.CO;2. ^ J. A. Wolfe; C. E. Forest & P. Molnar (1998). "Paleobotanical evidence of Eocene and Oligocene paleoaltitudes in midlatitude western North America". Geological Society of America Bulletin. 110 (5): 664. doi:10.1130/0016-7606(1998)110<0664:PEOEAO>2.3.CO;2. ^ S. Brunsfeld, J. Sullivan, D. Soltis, and P. Sotis (2001). "Comparative phylogeography of north-western north america: A synthesis". In: Silverton, J., Antonovics, J. (Eds. ), Integrating Ecology and Evolution in a Spatial Context. The 14th Special Symposium of the British Ecological Society. British Ecolological Society, Blackwell Science Ltd., Ch. 15, pp. 319–339. ^ The Geography of Alaska: Physical Geography, Alaska Humanities Forum: "At a very general level, Alaska is part of four general physiographic regions, the Interior Plains, Rocky Mountains, Intermontane Basins and Ranges, and the Pacific Mountains and Valleys". ^ Wheeler, J. and Kostbade, J. World Regional Geography (Saunders College Publishing 1990): "The mainland ranges of the panhandle are a northward extension of the cascade range and the British Columbia Coastal ranges, while the mountainous offshore islands are an extension of the Coast Ranges of the Pacific Northwest and the islands of British Columbia." ^ William Bailey et al. The surface climates of Canada, McGill–Queen's Press – MQUP, 1997, p. 226. ^ a b Encyclopedia Americana: the International Reference Work, Volume 18: "Sierra Madre del Sur. — This sierra, which crosses the states of Colima, Michoacan, Guerrero, and Oaxaca, is the continuation of the Sierra de Baja California and the other mountain ranges linked with it." (Americana Corporation 1961). ^ Hultén, Eric. Flora of Alaska and Neighboring Territories: A Manual of the Vascular Plants, p. xiv (Stanford University Press, 1968). ^ Stefoff, Rebecca. Alaska, p. 14 (Marshall Cavendish, 2006). ^ a b c Wilson, Robert J. Geology and Economic Minerals of Canada, p. 26 (Geological Survey of Canada, Department of Energy, Mines and Resources, 1976). ^ Rogers, John. A History of the Earth, p. 281 (CUP Archive, November 18, 1993). ^ Solski, Ruth. Canadian Provinces & Territories Gr. 4-6, p. 91 (S&S Learning Materials 2003). ^ "Visiting the Hoh Rainforest". U.S. National Park Service. Retrieved January 27, 2011. ^ "SEQUIM 2 E, WASHINGTON Climate Summary". Western Regional Climate Center. Retrieved January 27, 2011. ^ California Coastal Commission (November 1987). The California Coastal Resource Guide. University of California Press. pp. 384 pages. ISBN 9780520061866. Archived from the original on December 22, 2007. ^ Parsons, M. and Quinn, O. "Insular and Coastal Mountains, Interior Mountains", Canadian Ministry of Environment: "Interior Mountains comprising the Columbia Mountains of the southern interior and the Omineca, Cassiar, Skeena and Hazelton Mountains of the northern interior." ^ a b Richard Cannings (2007). The Rockies: A Natural History. Greystone/David Suzuki Foundation. p. 5. ISBN 9781553652854. ^ Merrill, Tim et al. Mexico: A Country Study, p. 80 (Library of Congress, Federal Research Division, Claitors Pub Div. 2005): "The Sierra Madre Occidental on the west is a continuation of California's Sierra Nevada (with a break in southeastern California and extreme northern Mexico)…." ^ Thiem, Jon. Rabbit Creek Country: Three Ranching Lives in the Heart of the Mountain West, p. 143 (UNM Press, 2008). ^ The Encyclopedia Americana, Vol. 23, p. 618 (Grolier 2000) ISBN 0717201333. ^ William Safire. The New York Times guide to essential knowledge: a desk reference for the curious mind, Macmillan, 2007, p. 623, ISBN 0312376596. ^ a b Edwin Bridges. World Geomorphology, Cambridge University Press, 1990, p. 88, ISBN 0521289653. ^ "Sierra Madre Oriental", Encyclopædia Britannica Online (2011). ^ Rebekah K. Nix. "The Gulf of California: A Physical, Geological, and Biological Study" (PDF). University of Texas at Dallas. Retrieved April 10, 2010. ^ "Columbia Plateau". Geographic Names Information System. United States Geological Survey. ^ Ben Floyd, et al. "Glossary Archived March 22, 2005, at the Wayback Machine". (1998) Hanford Reach Protection and Management Program Interim Action Plan Archived September 27, 2007, at the Wayback Machine. Prosser, Washington: Benton County Planning Department. ^ "Boundary Descriptions and Names of Regions, Subregions, Accounting Units and Cataloging Units". U.S. Geological Survey. Retrieved October 23, 2010. ^ "Colorado Plateau". Geographic Names Information System. United States Geological Survey.